Thorough, disciplined account of a terrifying fire that ripped through the Okanogan National Forest near Washington State’s Canadian border in 2001. Maclean begins with a nod to one of his previous books on the subject of firefighting. A number of new safety measures were instituted after 14 firefighters perished in the 1994 South Canyon tragedy analyzed in Fire on the Mountain (1999), but few could have predicted that the measures would be tested so soon. Just seven years after South Canyon, an improperly extinguished campfire abandoned during a smoking-hot summer in the North Cascades mountain range provided another stern trial of the firefighting community. Maclean divides the story into three parts. He begins by outlining the various people who headed into the woods to do battle with the fire on that fateful day, highlighting character traits that would play a vital part in the tragedy. The second section concentrates on how the fire was tackled, cataloguing mishaps and errors that included problems with the hoses, failure to obtain helicopter support and neglect that led to innocent bystanders Bruce and Paula Hagemeyer becoming entangled in events. The author comments on these incidents while describing a fire spiraling dangerously out of control to claim the lives of four firefighters and injure many others. 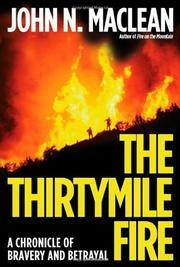 The final chapters focus on the fire’s aftermath, with the deceased’s families quickly turning from sorrow to bitterness and recriminations, especially after the release of a report by the Occupational Safety and Health Commission that suggested the dead may have ignored orders. Maclean mostly keeps his opinions to himself, offering a narrative that comprehends many conflicting viewpoints. A richly descriptive chronicle of disaster from an expert on the subject.